1 of 5 Heat grill to medium-high. Bring vegetable broth and 1/2 cup water to a boil in a medium lidded pot. Stir in couscous, olives, dates, 1/2 tsp of the ras el hanout and 1/4 tsp of the salt. Cover, remove from heat and let stand 5 minutes. 2 of 5 Place zucchini slices in a large bowl and toss with oil. Thread onto skewers and sprinkle on both sides with 1/2 tsp of the ras el hanout and 1/4 tsp each of the salt and pepper. Grill zucchini 5 minutes; turn over and grill an additional 5 minutes. Transfer to a platter and remove skewers. 3 of 5 Season salmon with remaining 1/2 tsp ras el hanout, 1/2 tsp salt and 1/4 tsp pepper. Spritz with nonstick cooking spray. Grill salmon skin side up 3 minutes. Flip salmon and continue to grill 2 to 3 minutes. Remove to platter with zucchini, leaving salmon skin on the grill. 4 of 5 Fluff couscous and transfer to a bowl. 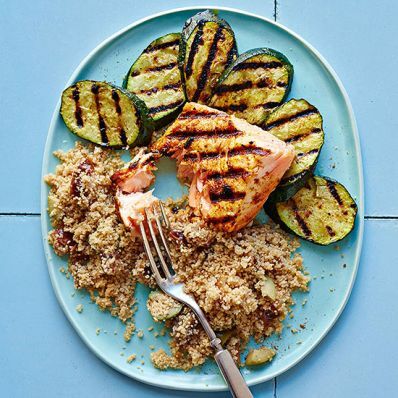 Serve alongside salmon and zucchini. 5 of 5 Note: The Moroccan spice blend ras el hanout is available from McCormick's, Williams-Sonoma and Whole Foods or at teenytinyspice.com. Per Serving: 760 mg sodium, 40 g pro., 512 kcal cal., 16 g Fat, total, 5 g fiber, 53 g carb., 3 g sat. fat, 90 mg chol.